Select wood rings are packaged 7 rings per package. Limited Quantity in White and Unfinished. The Oriel decorative bay window rod is adjustable to fit most standard bay windows. Each section is completely adjustable for a perfect fit. It features a wonderful wrap around to the wall feature allowing complete privacy. 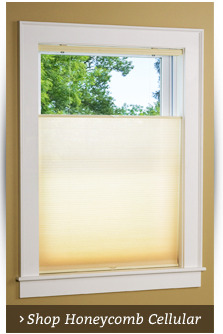 Also blocks light filtration around sides and is an energy saver when used in combination with thermal or black out curtains. Use it to hang grommet, tab top, or rod pocket curtains, spaghetti straps, and Euro rings. * 3/4" diameter adjustable telescopic steel rod. * Wall mounting end brackets included; four adjustable wall brackets, and two end mount brackets are included in set. * Two flexible elbow joiners in each set. 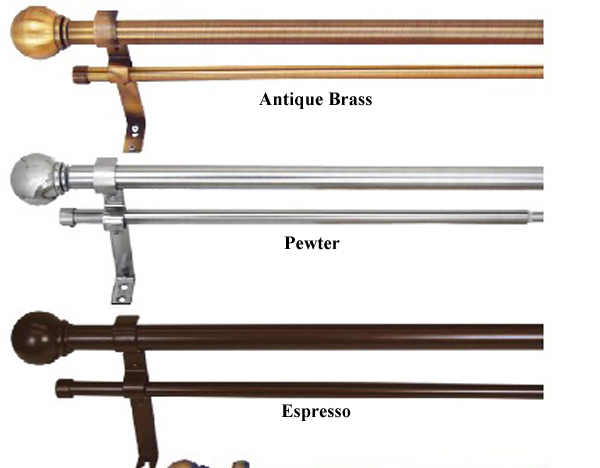 * Each section of the rod set is individually telescoping. 5/8 inch diameter adjustable telescoping steel rod fits from bracket to bracket of any previously installed drapery rod with flat brackets. 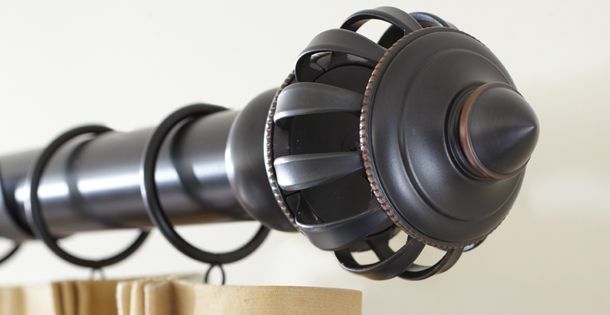 It is made to fit most flat brackets supporting 5/8", 3/4", or 1 inch diameter rods. 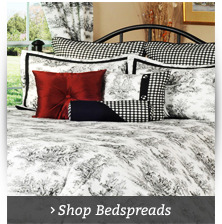 Each section is completely adjustable for that perfect fit! The Double Rod Solution can be used to hang all Panels: Grommet, Tab Top, Spaghetti Straps, Euro Rings, and rod pocket. It's perfect for creating that layered look without having to change your existing drapery rod! One Double-Up Rod is required for 28" to 48" rods. 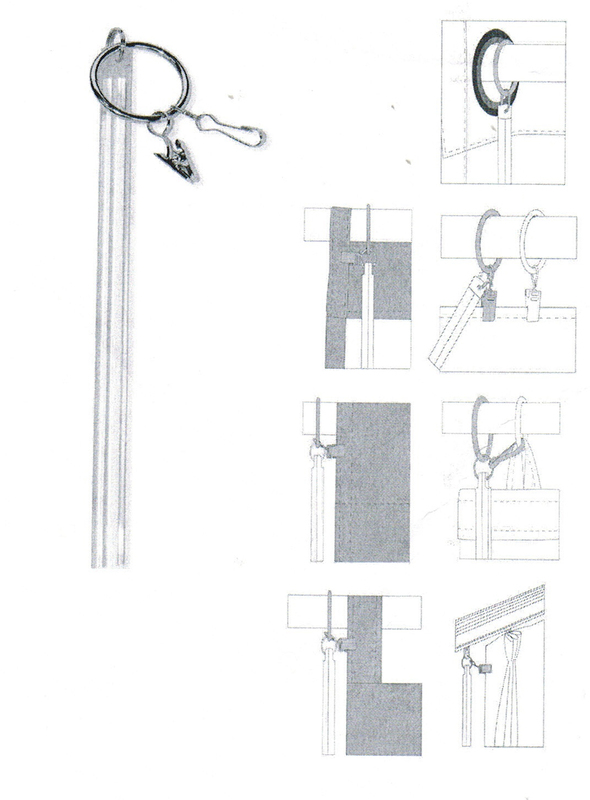 Two Double-Up Rods are required for 48" to 86" and 166" to 144" rods. TWO specialized END MOUNT BRACKETS are included with each rod set. 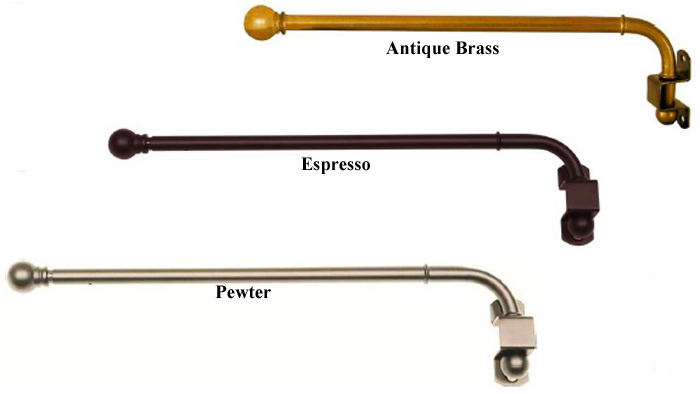 Beautiful Cambridge Telescoping Rod Sets are one inch in diameter and comes in two lengths: 32 to 86 inches, and 86 to 144 inches. 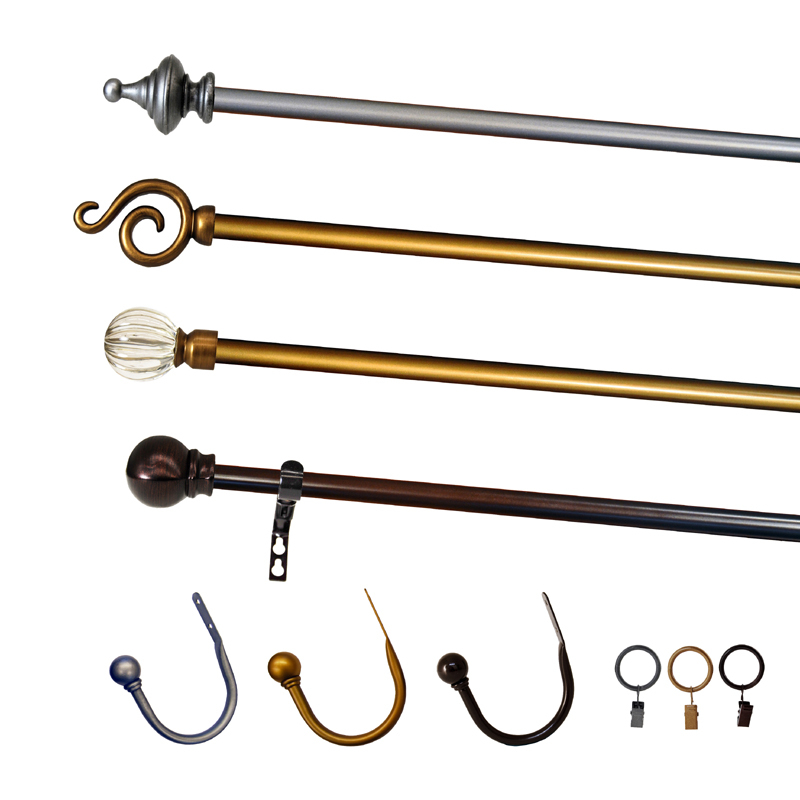 Set includes one rod, two finials, and the appropriate number of adjustable brackets. 3/4" diameter adjustable telescopic steel Wraparound Rod has a 3 1/2" projection. This is the ultimate solution for privacy over a traditional projection rod. 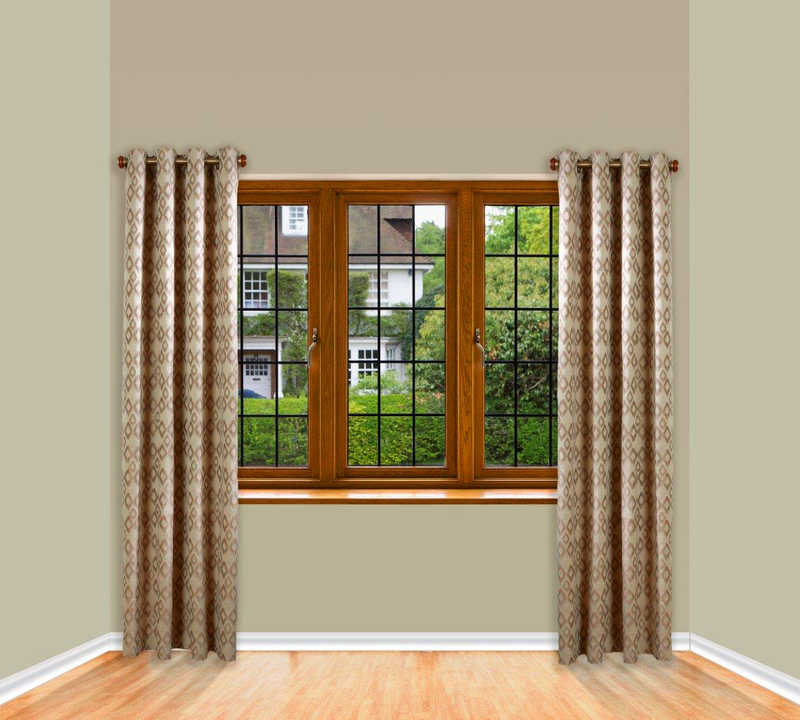 Our privacy rod features a gentle curve on each side of your window making it easy to pull your curtains completely to the wall enclosing both side of your window. It blocks light filtration around the sides, and when used in combination with thermal drapery, serves as an energy saver and noise reducer. 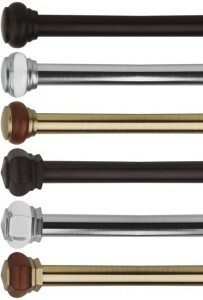 Our 3/4" diameter metal Wrap Around Rod is offered in three beautiful finishes: Brushed Nickel, Espresso, and White. Our plated finish double rod set is a telescoping double rod offered in three lengths: 28 to 48", 48 to86" and 66 to 120". * Two Finials and two End Caps are included with each set. 1" Double Rod Set - Solutions! 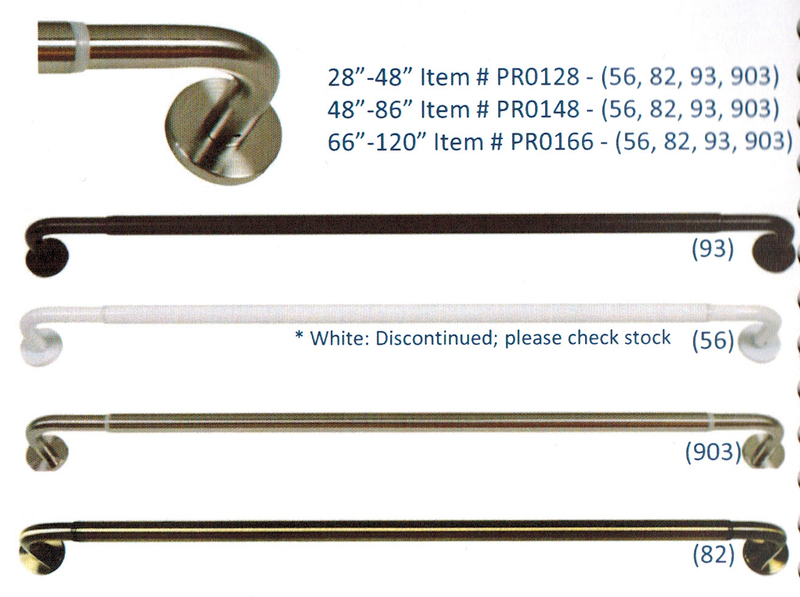 1" diameter metal rod set is offered in three sizes: 28 to 48 inches, 48 to 86 inches, and 86 to 144 inches. 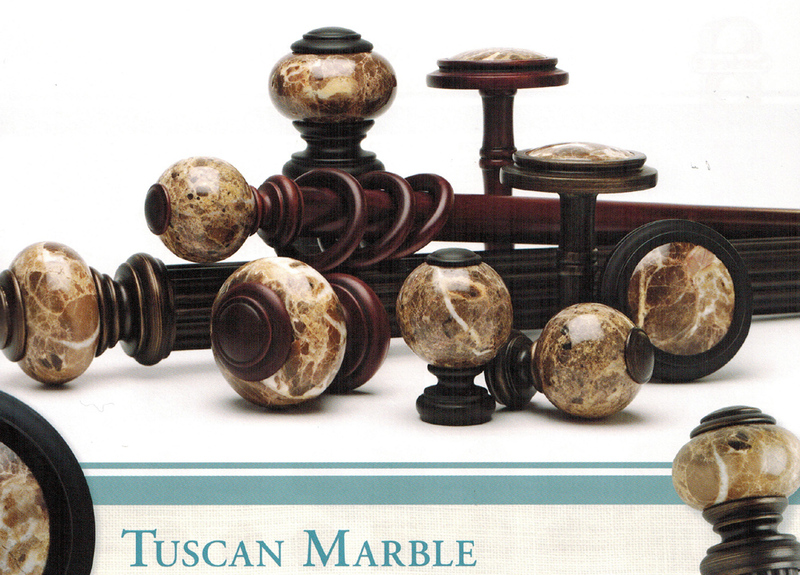 The set includes the curtain rod, a pair of finials, and brackets adjustable from 4" to 5 1/2". Two brackets are included with a 28 to 48 inch, three brackets are included with a 48 to 86 inch and a 86 to 144 inch rod set. Rod sets are plated finish. Finishes include Pewter, Antique Bronze, Antique Brass, and Gunmetal Gray. Indoor Outdoor Curtain Rods with two telescoping rods (5/8" diameter) come in two sizes: 28" to 48" wide, and 48" to 86" wide. Double rod sets have ball finials on front rod, end caps on back rod. Bracket projection is adjustable from 5" to 7.5". Selected plated finish in Pewter or Antique Brass. Adjustable pivoting telescopic steel Swing Arm Rod Set adds so much to the overall look of the window. They are perfect for creating that layered look! Our adjustable 1/2" diameter swing arm rod set are great for any light weight curtains. Use them on french doors, small windows, and bay windows. 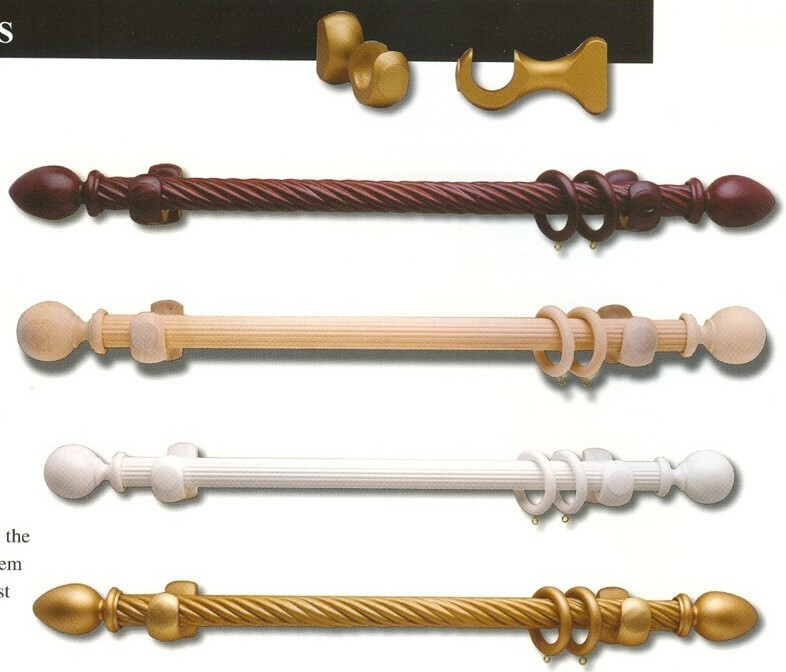 These curtain rods are fabulous to hide an appliance alcove or a messy area. Consider creating a simple canopy or a room divider. The Swing Arm Rods can close your drapery, draw them to the sides, or you can swing one or both away from the window when full light is desired. • Adjustable 1/2" diameter swing arm rod fits 1-1/2" rod pockets or larger. 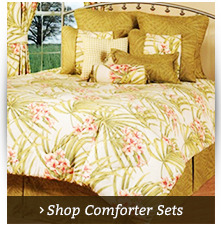 * For use with light weight curtains. * Set includes two (2) swing arm rods with 1/2" long ball finials, one left and one right. * Exclusive Easy-Leveling Brackets are included. * Hardware and instructions are included. * Can be mounted outside of the window molding. Select from three finishes: Pewter, Antique Brass, and Espresso. 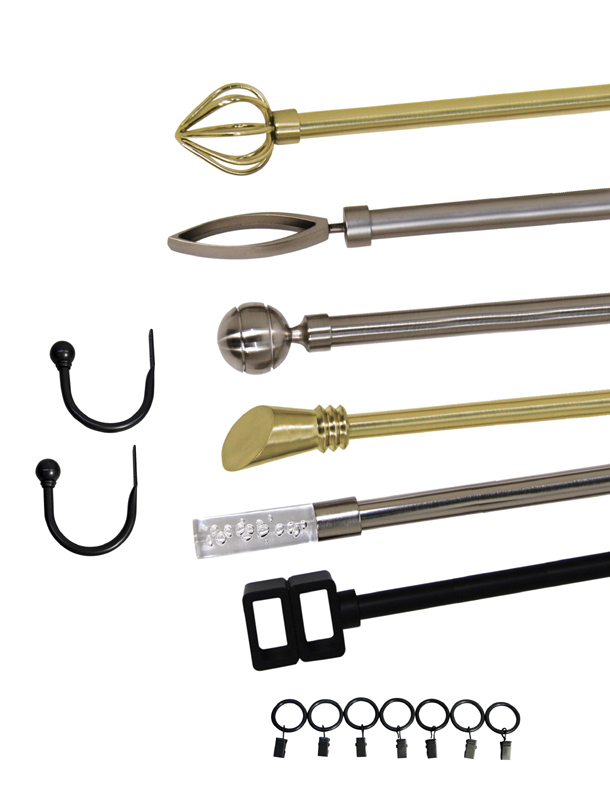 3/4 inch diameter Elite Metal Rod Set is offered in two sizes telescoping from 30 to 78 inches, or 66 to 120 inches. The set includes a pair of finials and three steel brackets in your choice of finish. Brackets adjustable projection is from 4 to 6 inches. Exotique steel rod is vinyl wrapped, giving the lustrous look of wood with the strength of metal, and telescopes to fit a range window widths. Finials include two Wood End Caps and Wood Brackets are included with rod. Wood brackets have 3 1/2" fixed projection. 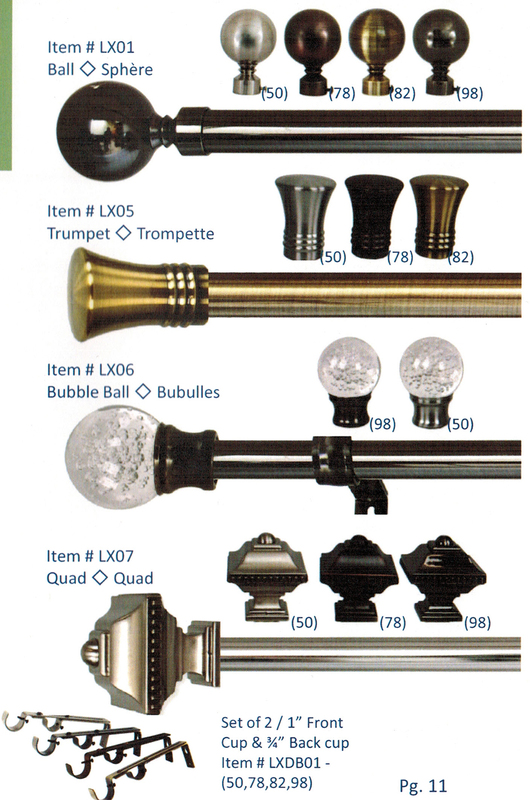 The End Cap Finials are great for close places that do not have room the a typical 4-1/2 inch finial. Rod lengths: 28" to 48" only. Brackets can be either wall or ceiling mounted. Installation instructions included. 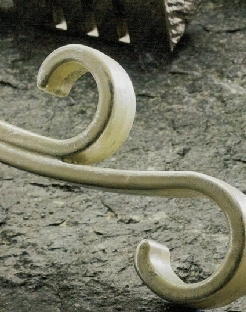 Hook finials, adjustable rod, and brackets are Pewter finish. Diameter is 3/4" Rod adjusts from 48" to 86" Set includes rod, 2 finials, 3 brackets and appropriate number of molly screws. Item is discontinued. ONLY ONE REMAINING IN STOCK. Rod diameter is 3/4". Length adjusts from 28" to 48". Set includes 2 Spear finials, one rod, 2 end brackets, and appropriate number of screws. 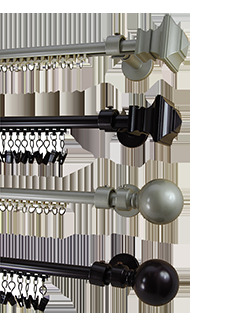 Made by Versailles this resin finish drapery rod set features spear shaped finials and telescoping rod in black. Set includes mounting hardware. Multi-purpose rod set is ideal for hanging, pinch pleated curtains, tab tops, tie-top curtains, grommet top, spaghetti top and rod pocket panels. Also excellent for wall hangings. Brackets can be installed above, beside, or on the window ferame. Brackets and screws are included. To install on drywall, drill a 3/16" hole and use wall anchors supplied. Rod diameter is 3/4 inch. Brackets adjust from 3.5" to 5.5". Set includes 2 finials, 1 rod, 2 brackets, and appropriate number of screws. Finish: Antique Copper, Satin Nickel is sold out. Multi-purpose rod set is ideal for hanging, pinch pleated curtains, tab tops, tie-top curtains, grommet top, spaghetti top and rod pocket panels. Also excellent for wall hangings. Brackets can be installed above, beside, or on the window frame. Brackets and screws are included. To install on drywall, drill a 3/16" hole and use wall anchors supplied. 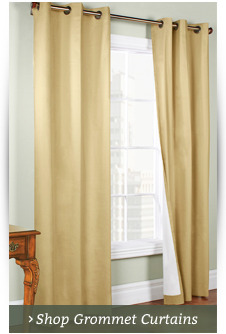 Add glamour to your windows with the 20 inch long Rod Duet Set for Stationary Panels. The rods are made of steel with Acrylic/Resin finials. 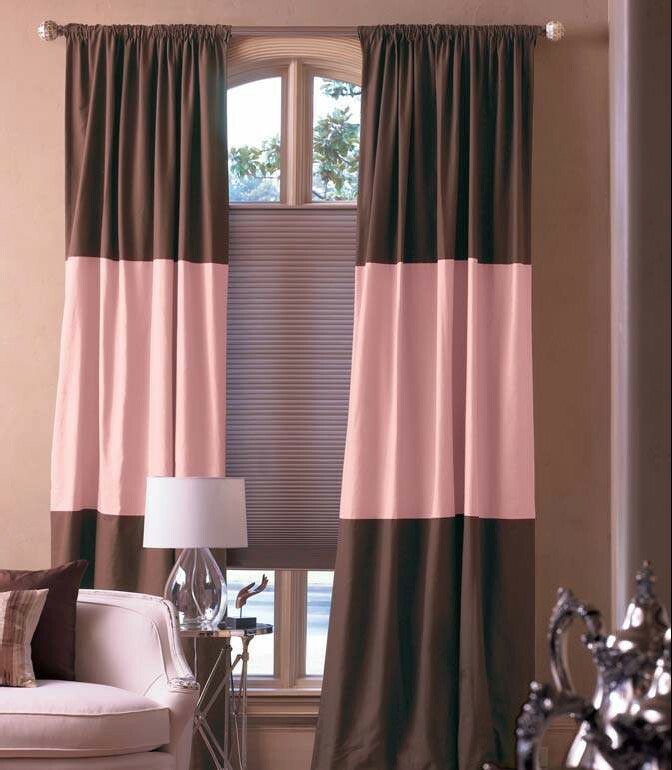 These are perfect for accentuating any window in your home where you want the soft allure of drapery but you don't want your beautiful view obstructed with curtains. Sold as a pair and includes four wall mounting brackets with an adjustable projection of 4 to 6 inches. Plated finish. 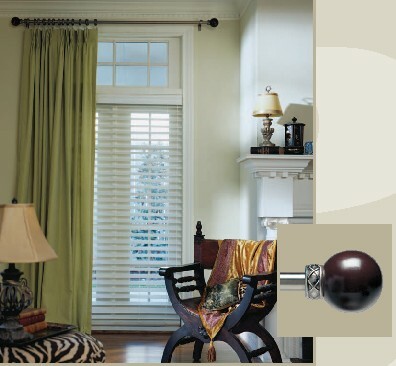 Are you looking for an attractive curtain rod set that is hard to find? 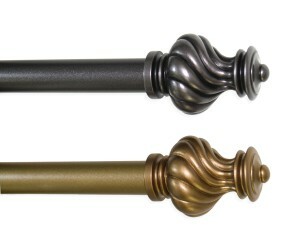 It's our Sculpted Metal Rod Set series. 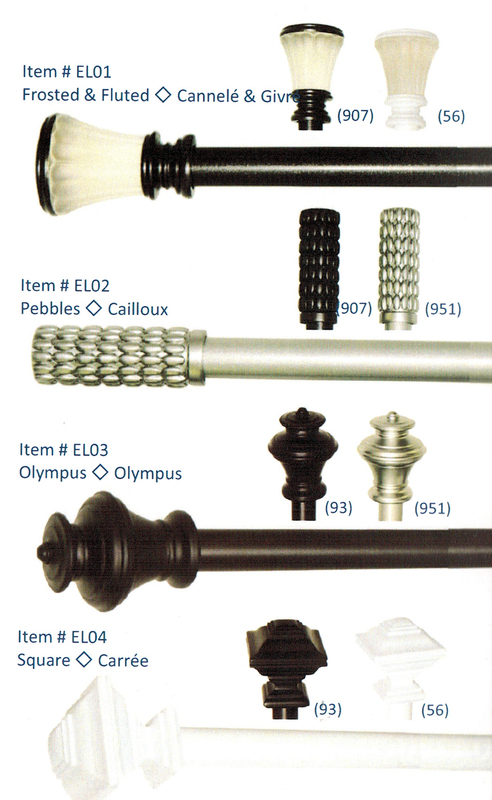 Select from three rod lengths with five different and unique finials. Each rod set is a 3/4 inch diameter adjustable telescoping steel rod with Acrylic/Resin finials. Each set includes three wall mounting brackets with 4 to 6 inch adjustable projection. 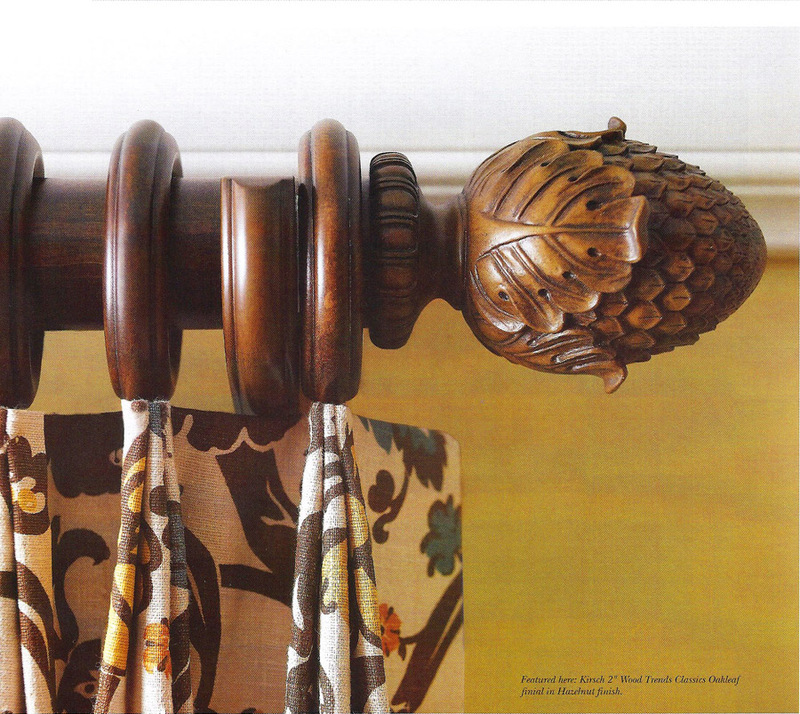 There's no better way to top off your new curtains, shades or valances than with a stunning decorative curtain rod. 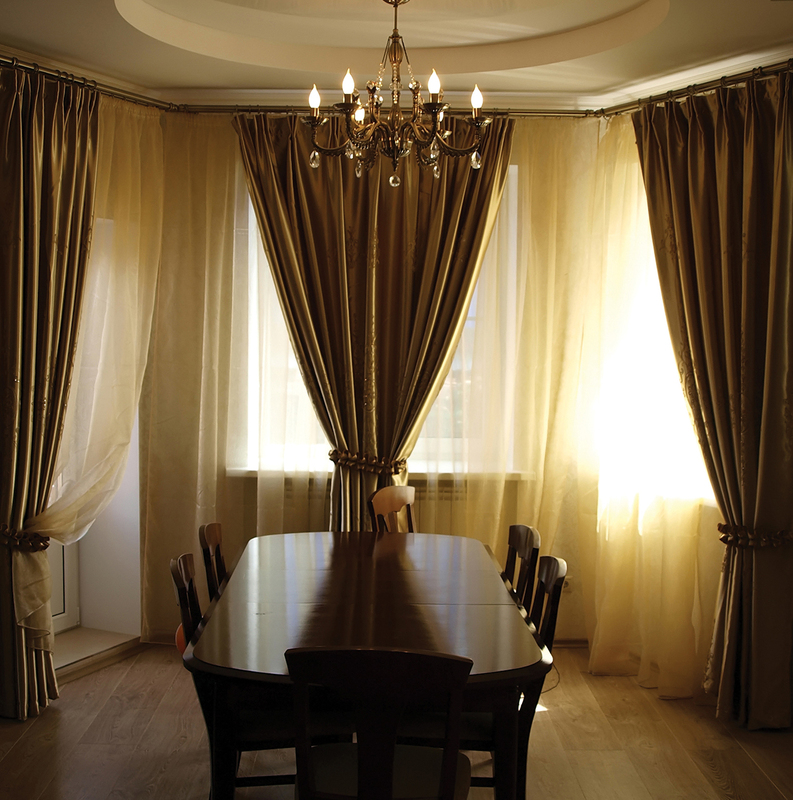 The Curtain Shop is an authority when it comes to helping customers find curtain rods that suit their precise home décor scheme, whether it be rustic, industrial, Tuscan, country, traditional, Victorian or modern. 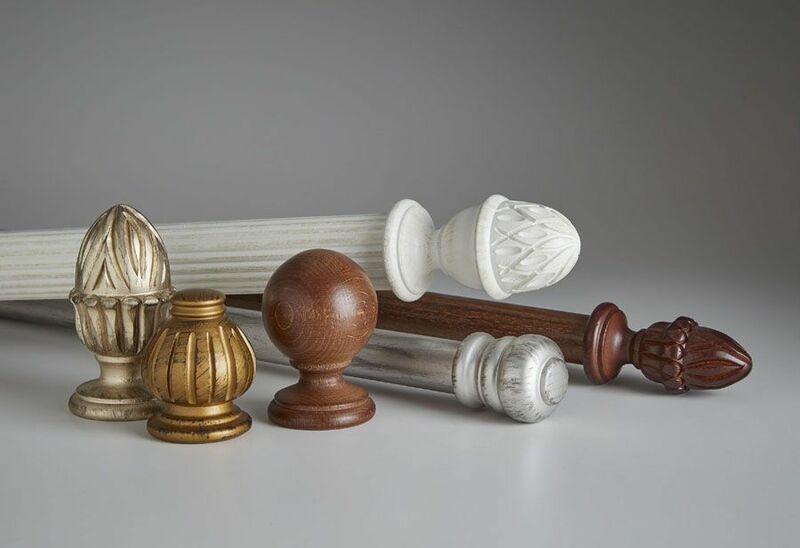 Bring decadent style to the master bedroom with a brass finial curtain rod or honor your earthy interior with wood-carved curtain rods by Kirsch. 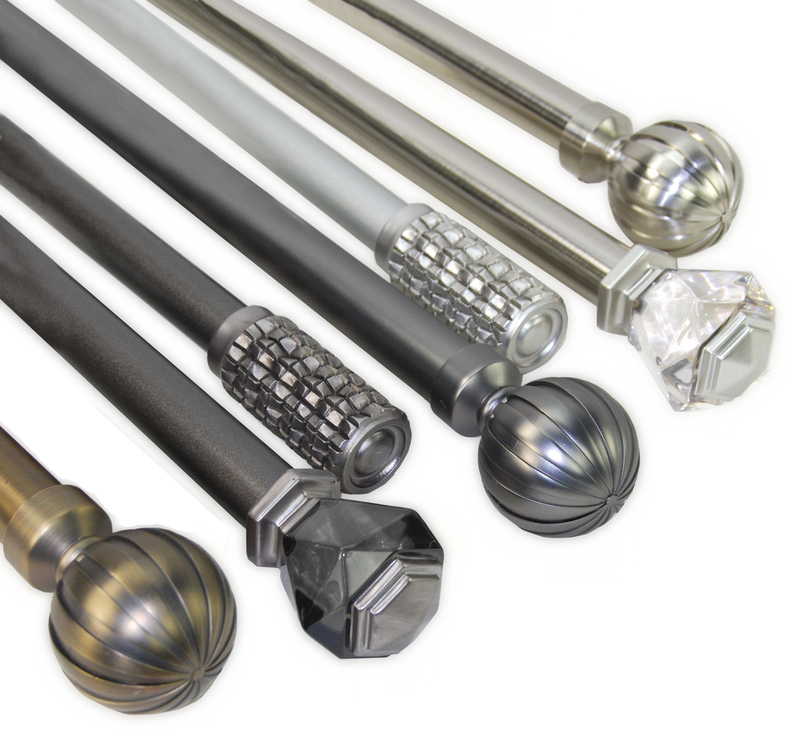 With over 60 years in business, The Curtain Shop is the best place to buy your decorative curtain rods. We carry decorative metal curtain rods, wood curtain rods and even decadent marble curtain rods made by leaders in the home décor industry. 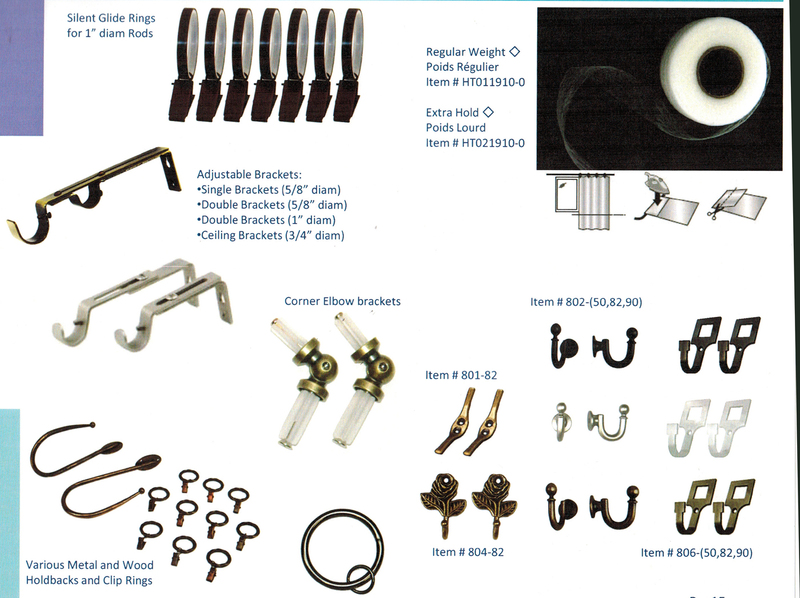 Shop indoor/outdoor curtain rods, wrap-around curtain rods, finial curtain rods, double curtain rod sets, swing arm curtain rods and so much more in our fantastic selection. We know it can be tough to know which type of rod to use for your specific window treatment, so our friendly and helpful customer service team is always on hand to assist you. Give us a call toll-free at 1-886-886-3632 with your questions.